Helen Birch's new book follows the same presentation format as her earlier two books, Freehand: Sketching Tips and Tricks Drawn from Art and Just Add Watercolor: Inspiration and Painting Techniques from Contemporary Artists. James Hobbs' Pen & Ink: Contemporary Artists, Timeless Techniques also follows the same format, so I now have four handbook-style books on drawing tips. This book has 208 pages. There are 100 tips on life drawing by artists. Each tip takes up two pages, the text on the left and the example drawing on the right. It's a book that you can read from cover to cover, or just flip to any page to get inspiration, to get an idea to do something different, to try something new. I find myself going back to all the four books frequently just to flip through randomly for inspiration. 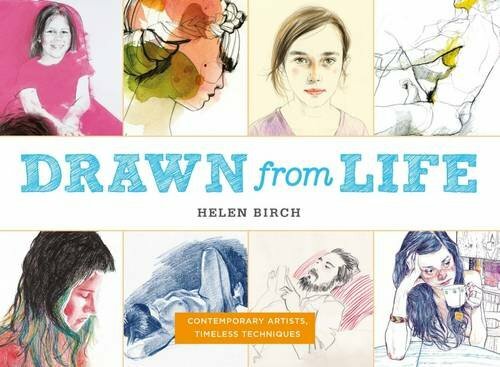 Drawn from Life collects tips and techniques that you can try out, and also offers suggestions what you can draw or materials to use. This book is meant to be used an idea book. As each tip only takes up two pages, there really isn't space for step-by-step tutorials. If you're really looking to learn techniques properly or a more practical guide, check out Anatomy Lessons From The Great Masters and Drawing Lessons From the Great Masters. Overall, it's an insightful book. The example artworks included are a mixed bag to me though, but the ideas and tips are great for practice and further exploration.